Wow, a rare instance of a Pokemon from Red being higher than Blue. Who'da thunk it? Scyther and Pinsir both don't have very good attacks, but have great stats as far as bugs go (which means average stats overall). Mainly, Scyther just looks cooler. I'll take scythes over pincers any day. BOOM. Scyther's got some fantastic Speed and Attack, and otherwise pedestrian other stats. It can learn Agility to get to ridonkulous quickness, and toss on Swords Dance to boost that Attack even further. The final two moves should be some combination of Double Team/Slash/Double-Edge/Hyper Beam. I guess you can put Rest instead if you want, but I kinda hate that move, especially in the first generation of games, so I ain't touching it. 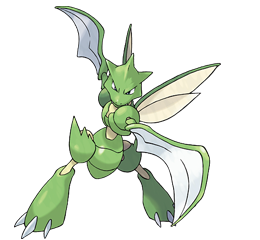 Theoretically, you could make a Scyther that features a moveset learned entirely naturally, devoid of TMs. Das pretty cool! What's not cool is how a Fire Blast will murder Scyther. But it looks so BAMF, so things basically balance out.